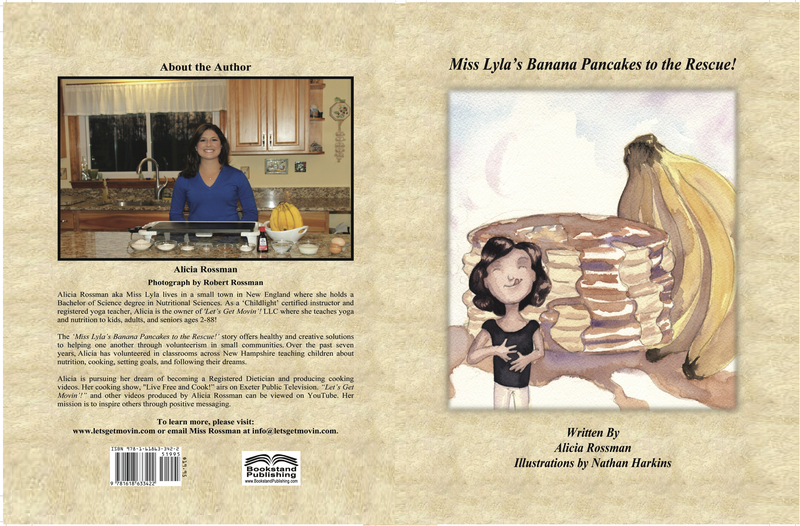 Inspired by First Lady Michelle Obama’s “Let’s Move!” initiative, Alicia developed the yoga program called “Let’s Get Movin’!” and wrote “Miss Lyla’s Banana Pancakes to the Rescue” to offer healthy and creative solutions to helping one another through volunteerism in small communities. Over the past seven years Alicia has volunteered in classrooms across New Hampshire teaching children about nutrition, cooking, setting goals and following their dreams. Alicia is pursuing her dream of becoming a Registered Dietitian and producing cooking videos. Her cooking show is called “Live Free and Cook!” aired on Exeter Public Television and her Let’s Get Movin’! Youtube Channel. Her mission is to inspire others through positive messaging. Miss Lyla’s Banana Pancakes to the Rescue! is prohibited from being reproduced, printed or uploaded without written permission from the author.